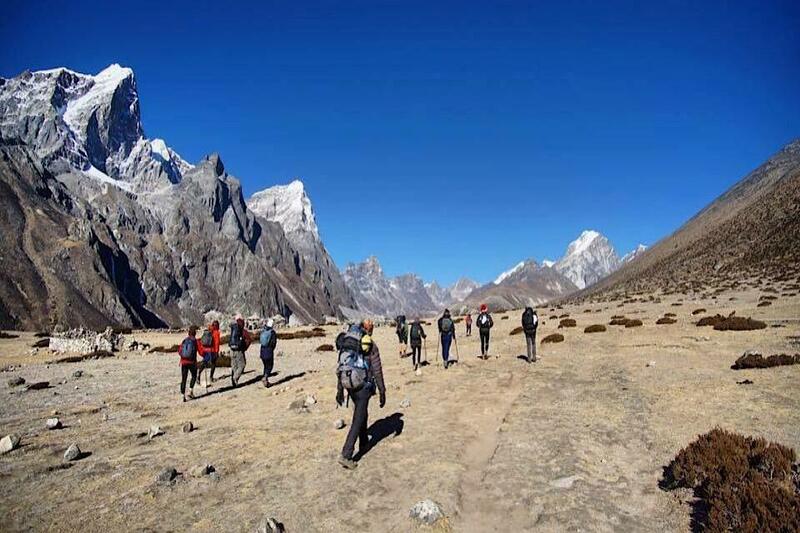 This challenging trekking & climbing expedition is located in the Mahalangur range of the Khumbu region. The Government of Tourism of Nepal opened this route from 2002 and since then the peak expedition to Kyajo Ri (6186 m) has been very popular. It was first climbed by the Franco British team in 2002. This peak can be attempted from different ways via southwestern ridge, southeastern ridge, and north but we will be heading from easiest and mostly adapted route - southwest ridge. Summiting to this recently opened peak Kyajo Ri is the combination of ascending rocky terrains and climbing through alpine snow steps. From the sharp edge of the summit, you get the spectacular views of the whole Khumbu Valley including dynamic views of Everest (8848 m), Mount Lhotse (8516 m), Mount Makalu (8463 m), Mount Cho Oyu (8201 m) and many snowcapped Himalayas. This 17 days journey begins from sightseeing few heritage sites of Kathmandu and taking a scenic airstrip to Tenzing Hilary airport, Lukla. First, we will be acclimatizing by a small trekking to Phakding and the next day following the trial of Dudh Koshi River, we head to NamcheBazar where mostly Sherpa communities reside. Next day to acclimate the altitude - we visit the Sherpa village and make our way to the hotel - Everest top view from where we get the spectacular view of Mount Everest. Continuing trekking the next day and crossing few of Sherpa villages, we head to Kyajo Ri Base Camp which almost takes a day. The following day we will again be acclimatizing the altitude. Again trekking through the rocky terrains we head to Camp I and take plenty of rest for acclimatization for a day or couple. Slowly we are headed trekking to Camp II. The next day we begin to summit Kyajo Ri and after successful completion, we retrace back to Camp II, Camp I, to Kyajo Ri Base Camp, then to Namche, again to Lukla and finally take an airstrip to Kathmandu. The auspicious time for this expedition would be in spring (March-May) and autumn (September-November). You can also dare in winter if you can survive the harshness of freezing cold temperatures to avoid crowds or else you can attempt in the specific season mentioned which are almost perfect. If you want to inquire more or want further information about this Everest Kyajo Ri Peak Climbing, please feel free to contact or email us. As you landed in Tribhuwan International Airport, Kathmandu, we, representative from Accent Himalayan, will welcome you, pick and drop to your respective hotel. In the evening you will be invited for welcome dinner hosted by Accent Himalayan. We will taste the delicious Nepalese cuisine with traditional culture. Early in the morning after having our breakfast around 6am we will be taken to Domestic terminal of Tribhuwan International Airport for an earlier flight to Lukla. With eye catching views of green landscape, laughing mountain and peaks with Diagrammatic vision, we will be landed at Tenzing Hillary Airport, Lukla. We meet our crew members and make arrangements and preparation for our trip. We start our trekking journey walking through the prosperous village of Lukla till reaching to Phakding. For the acclimatization we make short trek for a day. However as interest we will visit monasteries nearby. Early in the morning with the sound of yak bell, we take our breakfast and continue to trek heading towards Namche Bazaar along the Dudh Khoshi River with nature-filled journey. We trek through pine forest and after while we come to across the Glistening Mt. Thamserku (6608m). as the weather condition, whether we may also have the views of glimpse of Mt. Everest peering over the Lhotse and Nuptse ridge. Our steps are paused for day at Namche Bazaar, entrance for Sagarmatha National Park as well as the main trading center of the region. We will cross more than four bridge (suspension) along with the last of Hillary bridge being the last on the trails of the day. Today we spend the day for acclimatization in Namche bazaar. As the health expert advice we have to stay active and move around even the during the rest days. We have few option for hiking and side trek for a day. We might hike up to Everest view point hotel and enjoy the magnificent views of Mt. Everest, and visit the Sherpa museum on the way to returns to Namche bazaar. 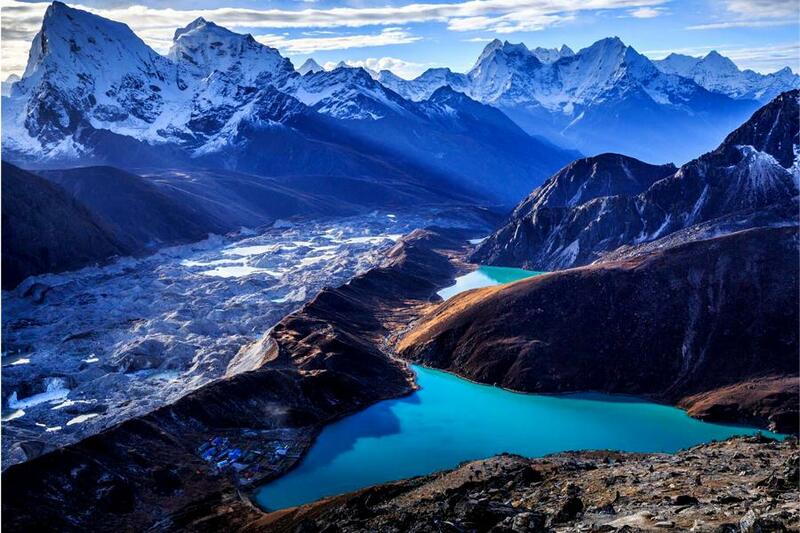 Or visit the Namche Bazaar and explore the Khumbu culture and tradition. Either to trek to Khunjung village for 5-6 hours. Today we continue to trek with walk to Thame from Namche Bazaar. Thame is the best and beautiful village with amazing vision of mountains and peaks. We make short trek from Thame to reach at Mende. Today we will have to reach at the main trekking point of our route. We leave the Mende following the main trails with faint yak trail. We will enter to the Kyanjo Drangka, isolated valley south of kkyanjo Ri. We will enjoy great views of the Himalayan peaks and mountains including Thamserku, Khumbila, Kusum, Kangaru, Kwangde and Pachharmo. Our destination of the day, Kyanjo Ri, is set up on a flat surface between the rocky mountain on one side and a small river on the other. Last day we reach at Kyajo Ri, and today we will rest at here and get the enjoyment of mountains and peaks. Next day we will prepare for summiting the kyanjo Ri peak, so we have to take a nice acclimatization. However as the advice of expert we have to move also on rest day. We hike to Camp I and come back. And check out our climbing equipment. We hike up to Camp I from our base camp. Next on the way, our trails follow the upward rocky section with a lot of boulders and skid pebbles. After few hours walking we will reach at Camp I crossing steep trails. We make our camp on a level ground and with good views. Also we spend whole day with acclimatization and rest for active and energetic body performance for summiting the Kyajo Ri on next coming day. We will have to climb up with technical assistance on the slope of about 60 degree. Because of lies in near to Glacier, have enough space to make our camping area. And we also see the route for following day summiting. We will be mesmerized through the sun light. We have to wake up early in the morning at about 3:00 am. After having light breakfast we start to climb through the rocky and big boulders. After reaching a part of the glacier from where our path is fairly hard climb with steepens and snow ice southwest ridge. Our trails is sharp summit is a narrow wedge of snow. We spend some time there and trek down to return to second camp. We will have to return back to base camp of Kyajo Ri. The trails of coming back are much easier than of summiting. Upon reaching to base camp we have to celebrate the success of summiting and coming back safely. Today we have to make long walk to return to Namche Bazaar. However before we return back, as human beings and responsible person, we will clean the Base Camp area make dirt by us for making global ecosystems on condition. We return back to Namche Bazaar crossing Mende and Thame. We return back to Lukla from Namche Bazaar, descending the steeply downward, with cautiously as our shaking legs battle the rocky terrain. We cross the fast flowing Dudh Koshi River and Its tributants over the suspension bridge. As descending down, our trails are more level and natural. We catch the earlier morning flight to Kathmandu after our long mountain trekking jouorney of two weeks. After reaching to Kathmandu we take rest for a while and after freshen up we will visit to tourist market. We will do souvenir shopping. At night we will take the farewell dinner and celebrate the succession party. Today our journey is going to completely finish and we will going to separate today. We will trade mails and photos. Before your flight to back (3 Hour earlier), our representative drop you to int’l airport and help till you checked out. We wish to see your positive responds.